With the proper maintenance, your beautiful ceramic tile countertops should last for years and years. You already spent the money for quality materials and installation, so don’t ruin things by repeating the mistakes that homeowners often make. Because of its grouted joints, ceramic tile is a relatively high maintenance type of countertop. You have to keep a close eye to ensure that it remains free of mold, mildew, bacteria and other contaminants. Here are some ceramic tile countertop maintenance tips to help keep surfaces clean and looking good for the long haul. This seems simple enough, but a lot of people overlook cleaning their countertop on a regular basis. 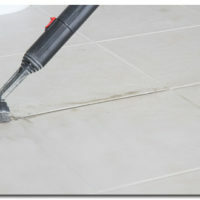 Even if you don’t use it often, it’s a good idea to give it a deep grout cleaning every once in a while. This is especially important right after your countertop has been installed, because the grout hasn’t cured completely yet and may be more vulnerable to dirt and grime. Don’t allow water and other liquids to sit on your ceramic tile countertop. Exposure to moisture can stain lightly colored grout or fade darker grout. Even worse, it will allow mold and mildew to form. After spilling a liquid or washing the tile, make sure to completely dry the entire surface – grout and all. Avoid using floor wax to polish your ceramic tile. The great thing about ceramic is that, with proper maintenance, it can continue to look polished for a fairly long time. However, if you feel it needs some polishing, you can use a clean, dry towel or a brush to do the job. Avoid dropping objects on your countertop because it can cause cracks and chips. When this happens, hire a tile replacement professional ASAP to prevent water from seeping beneath the surface. If you need assistance with tile and grout cleaning, tile replacement or other ceramic tile countertop maintenance, The Grout Medic has a solution for you. Contact your local Grout Medic location today to schedule an appointment! Call 1-866-994-7688.